The Tennessee State Employees Association was formed in 1974 by a group of concerned state employees. To this day, the association continues to be governed by a Board of Directors made up entirely of active and retired state employees elected by their peers. TSEA is unique because it is run by you, actual state employees. Below is a partial list of TSEA’s accomplishments over the course of the last 40 years – without TSEA, these items would not have happened… without members, TSEA would not exist. Protected the safety and privacy rights of state employees with vital legislation restricting public access to personal information contained in personnel files of employees. During the legislative session, the TSEA lobbying team is hard at work on state employee issues at Capitol Hill. A glance at TSEA’s legislative accomplishments over just the past 20+ years shows just how effective those lobbying efforts are. TSEA’s legislative record is one of the best on Capitol Hill. TSEA drafts and lobbies legislation to improve state employee pay, benefits and working conditions; to provide fair employment standards and grievance procedures; to ensure job security; and to improve retirement benefits. TSEA’s lobbying team then works with legislators to turn that legislation into law. Ensured the 1.5% raise in 2013 would be a true across-the-board raise paid to all state employees – i.e. employees cannot be denied their raise based on performance or disciplinary record. 1.5% Raise for Higher Education employees. Defeated efforts to change TSEA Association status in TN Code. Defeated efforts to ban payroll deduction of dues. Passed legislation allowing state employees to be paid poll workers for county election commissions on election days – (bill passed unanimously). Continuation of the $50 match for the 401K plan. Protected Pension Plan for all employees in the TCRS system prior to July 1, 2014. Ensured new Hybrid Pension Plan (for all new employees hired on or after July 1, 2014) will provide employees the option to have the investment of their balance mirror the TCRS investment portfolio. Passed legislation establishing a one-year parking fee pilot program at University of Memphis waiving parking fees for employees making under the state average salary. Protected state employees’ right to not be fired, demoted, or suspended without cause – now included in the TEAM Act. Ensured the 2.5% raise in 2012 would be a true across-the-board raise paid to all state employees. Supported a 3% Cost of Living Raise for Retirees. Continuation of longevity payments of $100 per year of service after 3 years. Passed the Voter ID bill for Retired Employees allowing retirees to keep their state photo id for voting purposes. Supported $30 million in salary upgrades and adjustments to be distributed in 2013. Supported promise to fully fund results of salary study in 2013/14 budget. Prevented changes to the Pension Plan – stalled efforts by 2 bills that would change our pension plan for all new hires to become more like a 401K instead of set pension plan. Continued funding for a severance package for all employees laid off to include $3,200 and 2 years of tuition assistance. Protected our right to participate in the election process with contributions to our PAC from payroll deduction of dues. Protected our ability to appoint members to certain state boards and commissions. Defeated efforts to change the way in which TSEA reports our financial records to the state. Defeated efforts to prevent members of the TSEA Board from using leave to attend the association’s meetings. 1.6% raise for all state employees, including Higher Education employees. Reduced the immediate layoffs at Greene Valley by negotiating 90-day extensions based on resident ratios. Maintained funding for the state’s 80% contribution toward the cost of employee individual/family health insurance. Successfully fought to continue severence package offered to all state employees who are laid off. Protected annual days to be used as leave for association business. The $50/month matching contribution to state employees’ 401(k) accounts was continued. Protected longevity payments of $100 per year of state service. Aggressively and successfully opposed a ban on payroll deduction of TSEA membership dues. Aggressively and successfully opposed the bill which would have denied TSEA and our state employee members the opportunity to participate in the political process through our PAC (Political Action Committee), TEAM. During one of Tennessee’s most difficult years economically in all of it’s history, facing massive layoffs, TSEA was successful in negotiating sufficient funds into the state budget – passed by both the Tennessee Senate and House and signed into law by the Governor – to safeguard, for one year, 559 of the many state jobs originally slated for layoff in the Governor’s proposed budget. Negotiated with the Tennessee Board of Regents to provide support staff involved in a RIF the same 90-day notice as other state employees. Secured and had signed into law the right of TSEA’s Board of Directors to take up to 12 administrative leave days per year to attend board meetings and conduct the Association’s business. Prevented a 5% state employee salary cut. Limited the private sector’s expansion of 150-bed “transitional facilities” – for persons presently incarcerated in Tennessee within one year of their release dates – to 150 state-wide and a maximum of four facilities, total. Helped secure legislation to enact a recession stipend for state employees (contingent upon sales tax collections exceeding predictions by $50 million). Although tax collections came up short, TSEA continued to fight into the next legislative session to secure the stipend, based on tax collections that were – at the time – improving. Faced with unprecedented tax revenue shortages, TSEA was able to postpone planned layoffs and negotiate stronger rights for state employees with passage of legislation that gives more flexibility to the Administration should layoffs become necessary. This legislation retained grievance rights and “bumping and retreating” rights as well as expanded the ability of employees to transfer to positions where they meet the job category criteria. Successfully passed legislation requiring employees’ longevity check be separated from their regular pay check, unless the employee elects not to receive a separate longevity check. Successfully passed legislation allowing state and higher education employees to participate in a retiree dental plan upon retirement effective January 1, 2010. The Association retained the $50 match to 401k. The proposed tobacco use surcharge of $50 per month was successfully postponed until January 1, 2011. A severance package was negotiated for all employees laid off after April 1, 2009 that includes $3,200 cash and 2 years of college tuition. The Employee Transit Card Program, also known as the Swipe and Ride program, was retained for the Nashville Metro area and expanded to include rail service. This benefit also now extends to the Memphis metro area. Faced with the possibility of a full-scale termination of over 2000 state employees, TSEA initiated a massive grassroots lobbying blitz that successfully averted proposed involuntary separations until January 1, 2009. 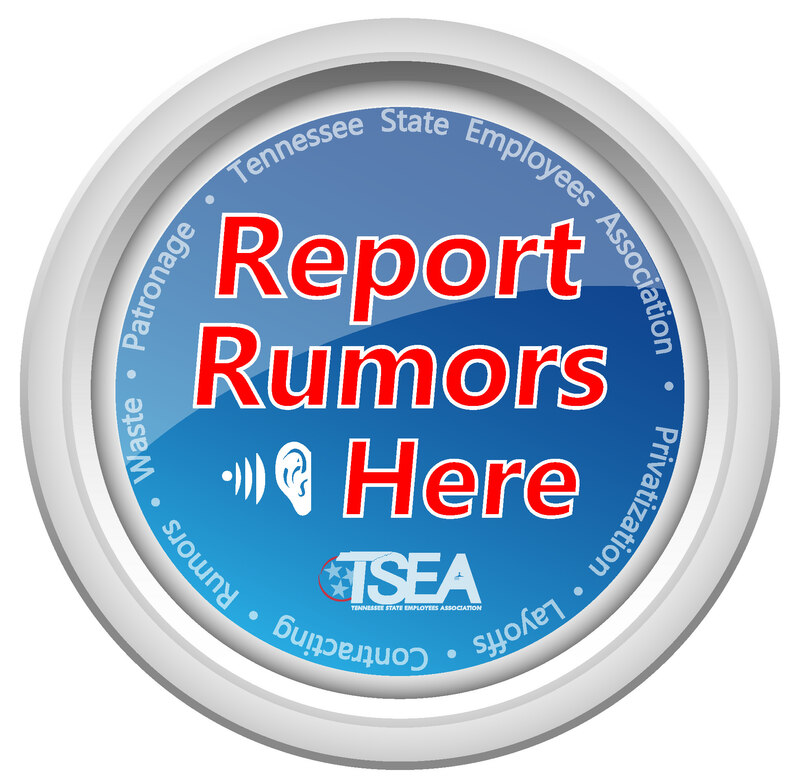 Although Governor Bredesen opposed any pay raises or bonuses, TSEA obtained $19.7 million for a $400 one-time bonus for state employees and higher education employees, with at least three (3) years of service history, paid in October 2008. The full amount of the bonus counts as earnable compensation for retirement purposes, unless under a statutorily mandated pay plan. $6.6 million in funding to continue the $50 state match to 401(k) contributions. Maintained funding for the state’s 80% contribution toward the cost of individual/family health insurance. Maintained funding at the same level for longevity payments. Secured funding to continue the state’s contribution toward the cost of Medicare supplement plans for retirees: $50 for employees with 30 years of service or more; $37.50 for employees with 20 to 29 years of service; and $25 for employees with 15 to 19 years of service. TSEA protected the safety and privacy rights of state employees by successful passage of vital legislation restricting public access to personal information contained in personnel files of employees. In addition to other currently protected personal information, home phone numbers, personal cell phone numbers, and home addresses, including city, state, and zip codes are no longer accessible by the public and the media. $42.3 million was approved for a full 3% across-the-board pay increase for all state employees effective July 1, 2007. A total of $23.8 million was approved in the budget for 1/2 of the remaining compression adjustment effective July 1, 2007. The cap per individual for full funding is $10,000. A total of $3.1 million was approved for a management salary plan – an increase for the Department Manager level up to the Commissioner level. A total of $6.6 million was added to increase the 401k match to $50, effective July 1. $33.0 million was approved for a 3% across-the-board raise for Higher Education employees. $75,000 was approved for Class Comp Adjustments. Longevity was continued at the same level. Comprehensive Pay Plan continues to be on schedule for finalization in December. State employees who do not enroll in the basic health insurance plan are now able to participate in the basic term life and accidental death & dismemberment insurance plans effective January 1, 2008. Legislation was passed to require agencies to compensate employees, regardless of budgetary constraints, if the employee is assigned to perform the duties of a higher level classification for more than 90 days. A full 3% across-the-board pay increase for all state employees effective July 1. A total of $21.1 million was approved in the budget for 1/3 of the compression for the first installment – July 1, 2006 – the average increase for the first 1/3 is 4.1%. The cap per individual for full funding is $10,000. A total of $1.4 million was approved for a management salary plan – an increase for the Department Manager level up to the Commissioner level. $15.0 million was approved for class upgrades to be determined. There was another $13.0 million approved for a one-time bonus of $350 that was paid in October 2006 for all employees with at least 3 years of service history. A total of $4.8 million was added to increase the 401k match to $40. $35.0 million was approved for a 2% across-the-board raise for Higher Education employees. Or, in lieu of this the BOR or UT system, was given the option of implementing a 1% minimum increase for faculty; and a 2% minimum or $600 increase for staff, whichever is greater. The percentage of raise can be increased with institution funds. There was another $14.0 million signed on to for one-time bonuses to Higher Education employees of $350 paid in October 2006 for all employees with at least 3 years of service history. $3.1 million was added to increase longevity payments of $100 per year to 30 years. $2.2 million was put into the budget to increase the state’s portion of the Medicare supplement insurance – The state’s portion was increased from $40 to $50 for employees with 30 years of service or more; $30 to $37.50 for employees with 20 to 29 years of service; and $20 to $25 for employees with 15 to 19 years of service. An additional $2.1 million was added to increase retirement amounts for employees who retired before July 1, 1989. A full 3% pay increase for all state employees effective July 1, 2005, up from the originally proposed 1%. $7.2 million approved in the budget just for state employees for class and computer upgrades. This was a $2.2 million improvement over the original $5 million proposal. A $10 per month increase in the 401(K)?employer match for all state employees including higher education, raising the total matched by the state to $30 a month. Continued funding for the state’s 80%?contribution toward the cost of individual/family health insurance. Funding was secured to continue the state’s contribution toward the cost of retirees’ Medicare supplement plans. A budget amendment, sponsored by Sen. Jim Kyle and Rep. Kim McMillan, was passed appropriating $108 million to complete the compression adjustment plan. In addition, an important provision was passed by both the House and Senate, directing the Department of Personnel to conduct a joint study with representatives of TSEA to address the issue of compression as well as development of a comprehensive pay plan. Successfully supported legislation that converted CSA employees to state employees. Opposed legislation allowing the leasing of employees. Opposed legislation that would adversely affect the merit hiring system. 3% raise effective July 1, 2004. Range moved by 3% effective July 1, 2004. One-time bonus of $70 per year of service. The minimum received by any employee with three years of service or less is $210 and the maximum paid is $1,750 for those with 25 or more years of service. The bonus counts toward earnable compensation for retirement purposes and is in addition to the regular longevity compensation. $11 million funded for classification upgrades effective July 1. $1.1 for increased mileage reimbursement. $27 million to pay the state’s portion of health insurance. $73 million to fund the TCRS pension plan. Longevity pay continued at $100 per year of service up to 25 years. $20 match for 401(K) continued. Included language in parks legislation to prohibit services contracts for jobs that are performed by state employees or that could be performed by employees. Stopped legislation that would have adversely affected the merit hiring system. Successfully opposed legislation that would prohibit mail order pharmacy savings. Increase in benefit cap for Class B retirees. Defeated language to reduce the state’s 80% portion of Insurance Premium. Protected 90 day notice for employees affected by layoffs. Defeated language which would have used days donated to sick leave bank to be used for administrative costs. Continued longevity at the current rate of $100 per year up to 25 years of service. Continued $20 match for the 401k. Rights of employees to access Internal Affairs Reports prior to due process hearing in law. Required sole source contracts over $250,000 to be filed with Fiscal Review Committee. 3% pay increase effective January, 2003; K-12 2%. Policy developed to require state departments to compensate employees at the time-and-a-half rate of pay when called into work on holidays or from annual leave unless at least 12 hours notice is given in advance of beginning the leave or holiday. Requirement in law for state to pay at least 80% of health insurance premium. The law previously required the state to pay at least 60% of premium cost. Requirement that employees who were adversely affected by the three-day furlough be made whole including pay and benefits. Protected current employee rights and benefits. 2.5% across-the-board pay increase retroactive to July 1. $100 per year of service longevity pay. $20 per month 401(k) match. State’s portion of insurance premiums funded at 80%. $7.7 million for class compensation and range movement. Successfully opposed privatization of state parks. Pay range minimum and maximum raised 4 1/2%. 3.5% across-the-board pay increase for state employees and non-faculty higher ed employees July 1. Whistleblower legislation protects state employees who report fraud and abuse. Allows state employees and their dependents to continue their state insurance as supplemental to Medicare at age 65 when they retire to maintain same benefits as basic plan. Protected employee discounts at parks. Successfully opposed shutdown of state parks and DOT garages. Achieved funding for management training. Maintained longevity pay and 401(k) match. Eliminated Social Security and driver’s license numbers from public records included in personnel files. Achieved protection for employees of TRICOR in special pay plan. Stopped privatization of the Department of Tourism. Defeated legislation to privatize 70% of prison beds. Defeated legislation to merge MHMR with Department of Health. Inclement Weather Policy put into effect. 2% pay increase for all state employees effective Jan. 1, 1999. $25.8 million to fund a service bonus of $50 for each full year of service up to 25 years for all state employees including those in higher education who have 3 or more year’s service by July 1, 1998. Bonus counts toward earnable compensation for retirement purposes and is in addition to the regular longevity compensation of $100 per year up to 25 years. $3.7 million to fully fund the $20 per month match on the 401(k) for all state employees including those in higher education. $1.7 million to increase the state’s support of retirees’ Medicare supplemental insurance. Supplemental retirement bridge for 2 years for law enforcement officers with mandatory retirement at age 60. Raised the cap on allowable retirement benefit to 80% of the member’s average final compensation for Group I and Class C members of the super ceded state retirement system. Authorized state employees to be represented at all steps of the grievance procedure. Established a 50% year-round discount for all state employees on camping fees charged at all state parks in the state system. Privatization of prisons put on hold. 2% pay increase for all employees January, 1998. $10 million for range adjustments and upgrades. Appropriation of additional state dollars to continue 40l(k) match at $20 per month. Civil service protections strengthened so that reorganization cannot result in individuals losing civil service status (retroactive to June 1, 1995). Career service employees with 5years of experience may promote to executive service with the right to return to a career service vacancy within 10 years. 3.6% retirement index fully funded for all employees in state service when retirement became noncontributory. Real compounded COLA for retirement benefits beginning in 1998. Requirement that career employees may not be asked to make conflict-of-interest disclosures unless directly related to work assignment. Disabled employees forced into retirement may continue state insurance until regular Medicare eligibility. 30 years of service state pays 80%. 20-30 years of service state pays 70%. 10-20 years of service state pays 60%. 25% tuition discount for children of deceased state employees. Continued protection of state employee rights and benefits. Salary range minimums were increased 5% and salary range maximums 13%. Budget included funding for fee waiver and discount programs for higher education of employees and their children. Monthly employer match of $20 continued for 1996-97 in 401(k). Funding for state’s portion of retirees’ health insurance premium. Funding for Medigap supplemental insurance program increased. Purchase of prior service made available on installment plan. 3.6% index used to compute retirement benefit continued another year. Service credit for peacetime military service expanded. Protected employees from losing pay, benefits and rights in proposed legislation to create Department of Children’s Services and to reform wel¬¬fare. Opposed legislation that would have allowed for the privatization of all future state prisons. Monthly employer match on 401(k) contributions of $20. Study of salary ranges, including compression and caps on ranges. Civil service protection for Public Service Commission employees. Longevity to recognize all prior part-time service of full-time employees with three years of experience, if part-time service is equivalent to five years of service. Bereavement leave extended for grandchildren and grandparents. Opposed legislation that would have harmed workers’ comp benefits for employees injured on the job. Opposed legislation that would have created a single Department of Children’s Services on July 1, 1995, and urged careful study of issues. 4% pay increase in January, 1994. Longevity raised to 25 years. Longevity for career part-time employees scheduled to work 1600 hours. Limited filling career service vacancies by temporaries to 90 days. Cost/benefit analysis disclosed by departments for purchases and other expenditures. 4% pay increase in January, 1993; 2% pay increase in July, 1993. Longevity pay increased two years for a total of 24 years. Grievance procedure for higher education employees. 90 days advance notice of potential job abolishment’s and layoffs. Career counseling, job testing and placement efforts for laid-off employees. 25% tuition discount extended to children of retirees and employees killed on the job. Successfully protested state’s plan to close state mental health institutions. State insurance benefits provided for part-time employees who have worked 24 months and work at least 1450 hours per year. A commitment of up to a 4% pay increase effective January, 1993. 25% tuition discount at state higher education institutions for the dependents of state employees. Job security for workers whose jobs are abolished and later re-established. Full credit for all years of state service during reduction-in-force for employees who have worked in more than one department. Five-year vesting rights for state employees in the TCRS. “Mismatch” legislation set a 90-day time limit on time an employee can be required to perform the duties of a higher-level position than job title without appropriate compensation. Employees’ evaluation procedure made grievable. Study to be conducted on the contracting out of traditional state services. Extension of 3.6 indexing for computing retirement benefits. Affects employees that worked under self-contributory system. Require bulletin boards in all state offices. Salary increase of.2.5 to 12 percent depending upon prior salary range. Legislation that allows employees to take one free course per semester at state colleges and universities, on a space available basis. Insurance benefits extended to part-time employees who work a minimum of 1450 hours per year. Increased credit for longevity pay to 22 years. Civil Service Commission was given authority to enforce its decisions. Salary increase of 2.0 to 5.6 percent depending upon prior salary range. Credit for longevity pay increased to 21 years. Legislation that gives TSEA representatives the right to access state employees at their work sites, provided there is no interruption of work. Extended Civil Service protection to non-certified personnel at state special schools. Average salary increase of 6.3 percent, plus funding for compression equity raises. Longevity pay increased from $95 to $100 per year up to 20 years service. Bereavement leaves for the death of an immediate family member. Sick leave credit is re-established immediately when a former employee returns to state service. Reduction in Force Reform Act which provides uniform procedures for bumping, retreating, and rehire order during a RIF. Continued funding for longevity benefit, increased from $90 to $95 per year of service. Salary increase for certain teachers in juvenile ‘and correctional facilities. Annual Step Bill provides at least one step raise, annually, for each employee (on steps 1-9). 4.5 percent salary increase, plus additional funding for compression equity raises. State pays 100% of insurance premiums for employees receiving worker’s compensation. Part-time employees working over 1600 hours receive full-time sick leave and annual leave benefits. Continued funding for longevity pay, increased from $85 per year to $90 per year up to 19 years service. Annual leave converted to sick leave annually instead of monthly. 5 percent salary increase. – 7.8 percent salary increase, instead of 3.6 offered by administration. Increase in longevity pay to $85 per year. Employees are paid’ for overtime instead of compensatory time for those who have reached maximum comp time balance. Insurance cost to be reduced by 10 percent if preferred provider option is implemented. Sick leave reinstated for employees that return to state service within six months. TSEA supported legislation to improve minimum retirement benefits and additional retirement credit for military service. 70% of insurance to be paid by state. State’s insurance contribution continues when an employee qualifies for Board of Claims coverage. TSEA opposed the deletion of additional jobs from Civil Service protection. 7.8 percent salary increase, instead of 3.6 offered by administration. Longevity pay increased to $75 per year. Employee Suggestion Award increased from $2,000 to $5,000. Sick leave must be granted if employee has a doctor’s statement. Employee must be informed of appeal rights in case of disciplinary action. 9.3 percent salary increase. Administration offered 5 percent. Longevity pay raised to $60 per year. Outlawed age discrimination against state employees. TSEA supported Civil Service Reform which enlarged commission and made its decisions binding. Establishment of longevity pay program. Involuntary transfers grievable to Civil Service Commission. Suggestion Awards Program for employee ideas which save the state money. Credit for old sick leave if an employee returns to state service within two years. TSEA makes the difference, but there is so much more to do! We invite you to join and make our voice even stronger! Not a member? Click here to learn how you can join today!